The fieldwork phase of the project to assess tree stocks in landscape nurseries across Australia moved to Andreasens Green recently, with visits to their Kemps Creek and Mangrove Mountain sites in New South Wales. 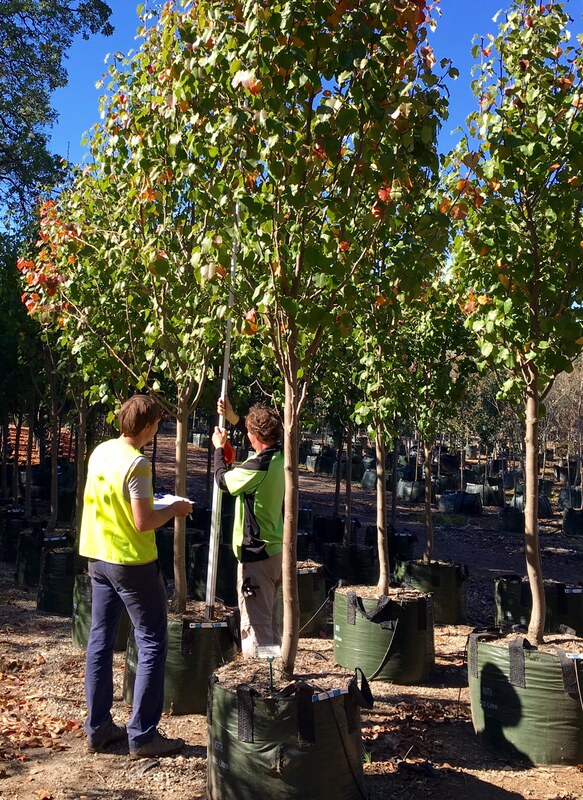 The project involves researchers from the Hawkesbury Institute for the Environment (HIE) taking extensive measurements of a wide range of tree species and container sizes to inform the quality parameters of a revised national standard. The team will check hundreds of trees at each site, taking physical measurements of calliper diameter (trunk at ground level), tree height using a Telescopic Height Measuring Pole, tree canopy diameter, and leaf area in selected trees. They also check the root health of trees to ensure there is no root girdling or circling roots. Key Account Manager Tim Carroll and Rob McEwan from Andreasens Green Wholesale Nurseries were on hand during the week of 23 May, working with Court Campany and Will Balmont from HIE to take the necessary measurements. Support from the nurseries involved in the field trials is essential, as the measurement phase requires a considerable level of pre-visit preparation. This helps the research team efficiently run through batches of selected species and ensure that the visits collect accurate and valid data to support the project without imposing too much on busy grower staff. 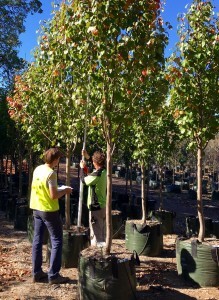 Andreasens Green has sites at Kemps Creek and Mangrove Mountain in NSW as well as at Yatala in Queensland, producing an extensive range of tree stocks suited to different climatic regions.